Handmade VGP Full-grain cowhide leather belt has a deeply Handmade design that extends the length of the belt, Each imprint has been Individually Handcrafted so Each Belt is Unique. 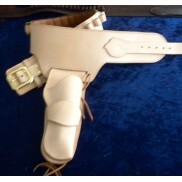 VGP Handmade Belts can also be made using the Main Back of the Hide which is the Most hard Wearing and Longer lasting part of the Hide and is Ideal for Belt Making, we use this Leather for making Revolver Belts due to the extra stress placed on the belt from the Holster and Revolver. This Leather is also suited to making work style belts where you have a range of tools attached to the belt. It Costs a little more so please contact us for Details. All VGP Handmade Belts can be made to your choice of design and color from the range of Tools and Dyes we have available, please contact us for Details. VGP Embossed Belts can be made in your choice of Color from our Dyes, and you can from the range of Patterns we have available at the time. 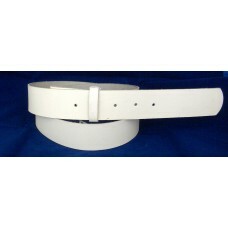 Most Belts are 1½" (38mm) Wide, other widths are available by special order (delivery Time Varies). 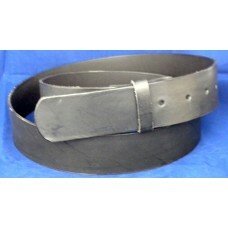 The Length of the Belt is measured from the Buckle pin to the Center hole of the 5 belt holes available when Using a Dress or Standard Buckles. Add 1" (25mm) Longer when Using a Trophy Style Buckles. Belts come without Buckles unless Stated. 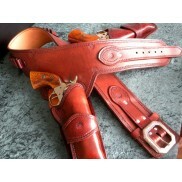 Buckles shown in the Photos are NOT Included in the Price of The Belt. Plain Leather Belt With No Design. Black 38"(98cm). Plain Leather Belt With No Design. Black 38"(98cm).Leather belt has No.. Plain Leather Belt With No Design. Black 42"(108cm). Plain Leather Belt With No Design. Black 42"(108cm).Leather belt has N.. Plain Leather Belt With No Design. Dark Brown 38"(98cm). Plain Leather Belt With No Design. Dark Brown 38"(98cm).Leather belt has&nb.. Plain Leather Belt With No Design. Dark Brown 42"(108cm). Plain Leather Belt With No Design. Dark Brown 42"(108cm).Leather belt has&n.. Plain Leather Belt With No Design. White 42"(108cm). Plain Leather Belt With No Design. 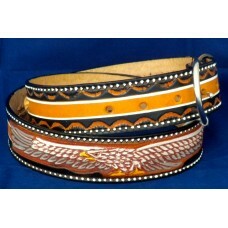 White 42"(108cm).Leather belt has N..
Texas Gold Embossed Leather Belt, Eagle Design in Tan and Black 38" (96cm). Texas Gold Embossed Leather Belt, Eagle Design in Tan and Black 38" (96cm).Texas Gold Embossed&..
VGP Embossed Full Grain Leather Belt Wildlife Eagle Design . 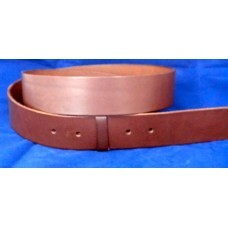 Range Tan 28"(71cm)..
VGP Embossed Leather Belt Rope Design. Black 38"(96.5cm)VGP Full-grain cowhide leather belt has..
VGP Embossed Leather Belt Silhouette Floral. Black 36"(91.5cm)VGP Full-grain cowhide leather be..
VGP Embossed Leather Belt Silhouette Floral. Black 38"(96.5cm)VGP Full-grain cowhide leather be..
VGP Embossed Leather Belt Silhouette Floral. 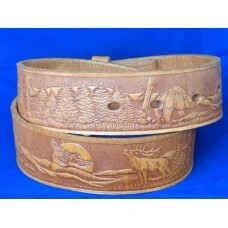 Black 40"(101.5cm)VGP Full-grain cowhide leather b..
VGP Embossed Leather Belt Wildlife Design. Black 34"(86.5cm)VGP Full-grain cowhide leather belt..
VGP Embossed Leather Belt Wildlife Design. Black 36"(91.5cm)VGP Full-grain cowhide leather belt..
VGP Embossed Leather Belt Wildlife Design. Black 38"(96.5cm)VGP Full-grain cowhide leather belt..
VGP Embossed Leather Belt Wildlife Design. Black 40"(101.5cm)VGP Full-grain cowhide leather bel..
VGP Embossed Leather Belt Wildlife Design. 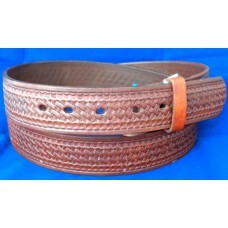 Brown 38"(96.5cm)VGP Full-grain cowhide leather belt..
VGP Embossed Leather Belt Basket Weave. Medium Brown 47"(119cm)VGP Full-grain cowhide leat..
VGP Embossed Leather Belt Flower. 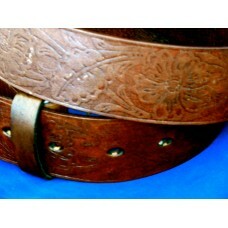 Brown 34"(88cm)VGP Full-grain cowhide leather belt has a embo..